BRISTOL - The Bristol Eastern girls basketball team defeated Plainville 71-47 on Thursday night at home. The Lancers, in winning their third straight game and eighth of their last ten, improved their season record to 11-7. With the loss, Plainville falls to 11-8. Eastern jumped out to a 19-11 lead after one period of play, highlighted by Jordan Ouellette scoring eight of her game high 24 points in the quarter. For the game, Ouellette also had 13 rebounds and five assists. Eastern had a strong team effort in the win, both offensively and defensively, and outscored Plainville in each quarter. 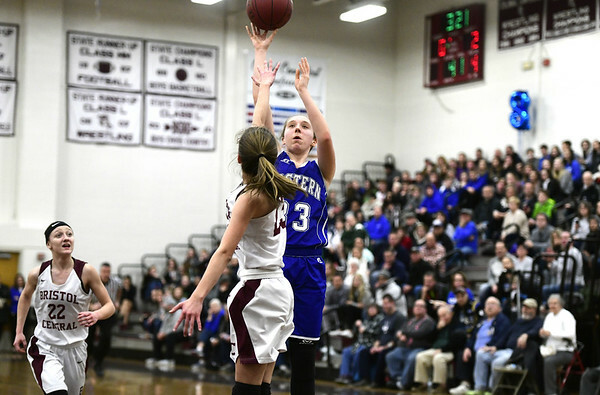 Ciara Collins scored 14, Paige McLaughlin scored eight, Meredith Forman had seven points and seven rebounds and Sage Scarritt added six points and 11 rebounds in Eastern's balanced attack. For Plainville, Jaida Vasquez (18 points), Caitlin Barker (10), Krystyna Miller (9) and Sam Lozefski (8) were the leading scorers. PLAINVILLE: Lilly Wazorko 0-0-0, Sam Lozefski 2-3-8, Caitlin Barker 4-1-10, Tessa Susco 0-0-0, Jaida Vasquez 5-8-18, Kori Jones 0-0-0, Elena Gorneault 0-0-0, Vanessa Xiques 0-2-2, Krystyna Miller 3-3-9, Katie Gagnon 0-0-0. Totals: 14-17-47. BRISTOL EASTERN: Jordan Ouellette 12-0-24, Paige McLaughlin 3-2-8, Julia Gettings 1-0-2, Meredith Forman 3-0-7, Ciara Collins 4-6-14, Alyssa Kehler 1-0-2, Audra Porowski 0-0-0, Sage Scarritt 2-2-6, Maura McGuire 1-3-5, Avery Arbuckle 1-1-3, Grace D'Amato 0-0-0, Riley Giblin 0-0-0, Janessa Gonzalez 0-0-0. Totals: 28-14-71. Three-point goals: Lozefski (P), Barker (P), Forman (BE). Records: Bristol Eastern 11-7, Plainville 11-8. Posted in The Bristol Press, Bristol Eastern on Friday, 8 February 2019 17:51. Updated: Friday, 8 February 2019 17:53.